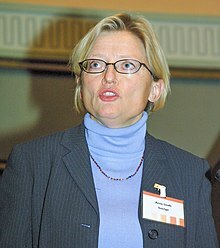 Ylva Anna Maria Lindh (19 June 1957 – 11 September 2003) was a Swedish Social Democratic politician who served as Minister for Foreign Affairs from 1998 to 2003 and Minister for the Environment from 1994 to 1996. She served as a Member of the Riksdag (MP) for Södermanland County from 1982 to 1985 and 1998 to 2003. Lindh was born to Staffan (1931-2017) and Nancy Lindh (1932-2005), in Enskede-Årsta, a suburb southeast of Stockholm, but grew up in Enköping. She became involved in politics at age 12, when she joined the local branch of the Swedish Social Democratic Youth League. Upon joining the party, one of her priorities was protesting against the Vietnam war. Lindh studied at Uppsala University, graduating as a Candidate of Law (jur. kand.) in 1982. Also in 1982, she was elected a Member of the Riksdag (MP) for Södermanland County. In 1984, she became the first female Chairman of the Swedish Social Democratic Youth League. Her six years as president were marked by a commitment to international affairs (including Nicaragua, Vietnam, South Africa and Palestine) and against the arms race which characterized the Cold War. Lindh served in the Riksdag from 1982 until 1985, and again from 1998 until her death in 2003. From 1991 to 1994, she was Commissioner of Culture and Environment and the Deputy Mayor of Stockholm. In 1994, after a Social Democratic victory in the election of that year, Prime Minister Ingvar Carlsson appointed her to his cabinet as Minister for the Environment. One of Lindh's legacies was her pioneering work towards European Union legislation on hazardous chemical substances. She also called for the establishment of a common EU strategy against acid rain. After the 1998 election, Prime Minister Göran Persson appointed Lindh to succeed Lena Hjelm-Wallén as Minister for Foreign Affairs in the new government. Having made influential friends around the world as president of the Swedish Social Democratic Youth League, Lindh ardently supported international cooperation through the United Nations and in the European Union. A high point in her career occurred during the Swedish presidency of the European Union during the first half of 2001. Lindh served as chairman of the Council of the European Union, responsible for representing the official foreign policy position of the European Union. Travelling with European Union Foreign and Security Policy Spokesman Javier Solana in Macedonia, during the Kosovo-Macedonian crisis, she negotiated an agreement which averted a civil war in the country. With Prime Minister of Serbia Zoran Đinđić in Stockholm. Lindh was due to meet Đinđić in Belgrade in March 2003, moments before his assassination. Six months later, she was stabbed to death by a Serbian assassin. Another talking point in her career was the violent repatriation of Ahmed Agiza and Muhammad al-Zery from Sweden to Egypt, an operation carried out by the US military. According to then Prime Minister Göran Persson, the US administration would put a trade embargo on the European Union, if Sweden did not let the Americans pick up Ahmed Agiza and Muhammad al-Zery on Swedish soil. Lindh had to choose between standing up for human rights and supporting trade relations with the US. She chose the latter, and was later extensively criticised for her actions. On 24 May 2004, when the committee against torture at the United Nations' Office of the High Commissioner for Human Rights found that the Government of Sweden had violated its obligations under the Convention against Torture in the forced repatriation of Agiza, Lindh had already been murdered. During the final weeks of her life she was involved in the pro-euro campaign, where she advocated for Sweden to become a member of the Eurozone. She led the yes campaign in the referendum. The referendum was held on 14 September 2003 (three days after her death). As a popular pro-euro politician, she was a spokesperson and chair for the yes campaign; her face was on billboards across Sweden the day she was murdered. Lindh married Bo Holmberg in 1991. Holmberg was Governor of Södermanland (her home constituency for over 20 years). The couple had two sons, Filip and David. On 16:00 10 September 2003, while shopping in the ladies' section of the Nordiska Kompaniet department store in central Stockholm for a televised debate later that night on the referendum about Sweden's adoption of the euro, Lindh was stabbed in the chest, abdomen and arms. At the time, she was not protected by bodyguards from the Swedish Security Service; this proved controversial, given the similarity between Lindh's murder and that of Prime Minister Olof Palme in 1986 (the first murder of a government member in modern Swedish history). She was rushed to Karolinska University Hospital, where she underwent surgery and blood transfusions for over nine hours. Lindh reportedly experienced severe internal bleeding and liver damage; her condition remained grave, although she appeared to have improved immediately after the surgery. An hour later, however, complications necessitated additional surgery; at 05:29 on 11 September 2003, she was pronounced dead. After a private briefing of her relatives and the government (and contradicting news coverage that she was alive in "grave" but "stable" condition), the announcement of her death made headlines across the European Union. The murderer escaped after the crime; according to eyewitness accounts, his actions appeared deliberate and systematic. A phone number was set up for anyone who might know anything about the crime, and a massive manhunt (centred on Stockholm) was launched in Sweden. After two days a photo of a man believed to be the murderer, taken by a camera on a floor above the murder scene, was released by police. Several items (pieces of clothing and a knife) believed to be connected with the murder were found outside the department store near a Stockholm metro station. At the crime scene, police obtained a handprint believed to be the killer's. Images of the suspect from the store's surveillance system were published on 13 and 14 September. A man was apprehended on 16 September and detained as a suspect on "justifiable grounds" (the lowest level of suspicion), but was cleared of all charges and released. On 24 September, the police announced that a suspect, Mijailo Mijailović (born in Sweden to Serb parents), had been apprehended and arrested at a higher level of suspicion: "probable cause". On 25 September, it was announced that Mijailović's DNA profile matched that of hairs on a baseball cap left at (or near) the scene of the crime, and he resembled the man filmed in the store where Lindh was attacked. After denying all involvement Mijailović confessed to the crime on 6 January 2004, providing a full account of the events of 10 September in an extra session of police questioning requested by Peter Althin (Mijailović's counsel). He was found guilty in a trial held from 14 to 17 January, and after a psychiatric evaluation was sentenced to life imprisonment on 23 March. On 8 July, an appeals court overturned Mijailović's sentence (after tests concluded he was mentally ill at the time of the murder), and Mijailović was transferred to a secure psychiatric ward. Prosecutors appealed to the Supreme Court of Sweden, which reinstated his sentence to life imprisonment on 2 December of that year. Mijailović renounced his Swedish citizenship, and has unsuccessfully requested to be transferred to Serbia. Despite Lindh's popularity and the timing of the assassination, the murder was not considered a political act (although a newspaper found a picture of Mijailović listening to Liberal People's Party leader Lars Leijonborg in clothing similar to what he wore during the murder). Mijailović admitted that he found the speech "entertaining", but denied allegations that it influenced his actions. In a 2011 interview with the newspaper Expressen, Mijailović said he had "felt hatred of [all] politicians" at the time, he had been high on a hypnotic drug at the time, and it was "a coincidence" that his victim had been Lindh. Mijailović has received counselling and other support services since his imprisonment. Lindh was an outspoken campaigner for Sweden to join the Eurozone in the referendum held on 14 September 2003. After the attack, all euro-campaign events were immediately cancelled. Television campaign advertisements were withdrawn, and all TV stations in Sweden halted commercials from the evening on the 10th through the 11th to help the public-service channels of SVT report news. TV3 merged its programming with ZTV and TV8, airing Efterlyst (a programme similar to America's Most Wanted) for people to send information directly to the police to help find the murderer. All campaign advertising on billboards was removed and advertising in printed media cancelled. The murder was seen as an attack on Sweden's open society, requiring unity rather than political campaigning. Following a midday meeting on 12 September, by Prime Minister Göran Persson and the leaders of the other political parties in the Riksdag, the decision was made not to let Lindh's murder affect the referendum. Information and resources on the referendum's issues would be fully available, but no political campaigning or debate would take place. Party leaders unanimously pledged support for the ballot as planned, and to abide by its result. Despite speculation that sympathy for Lindh could influence the voting, the euro was rejected in the referendum. Following her death, Junior Foreign Affairs Minister Jan O. Karlsson, was appointed acting Minister for Foreign Affairs. In October of that year, Laila Freivalds was appointed the successor to Lindh's cabinet post. A number of commemorative gatherings were held for Lindh throughout Sweden and abroad (through the Church of Sweden Abroad) on 12 and 13 September. One gathering, in the centre of Stockholm, attracted tens of thousands of mourners. A more formal commemoration was held at Stockholm City Hall on 19 September, at which King of Sweden Carl XVI Gustaf, Prime Minister Göran Persson, Chris Patten, Margot Wallström, European commissioners and the Swedish-speaking Greek Foreign Minister George Papandreou spoke. U.S. Secretary of State Colin Powell was unable to attend due to travel difficulties, but sent condolences. Lindh was buried privately on 20 September from the Church of Ersta [sv] in Stockholm; her grave is in the cemetery of nearby Katarina Church. Thousands of roses and candles were placed at Rosenbad (the government building) and outside the store where she was murdered. Abroad, hundreds of thousands of flowers and candles were left at Swedish embassies and consulates by mourners. In April 2004, Lindh posthumously received the "Statesman of the Year Award" from the EastWest Institute, a trans-Atlantic think tank which organizes an annual security conference in Brussels. Room 50.4 on the fifth floor of the Justus Lipsius European Council building in Brussels was named the Anna Lindh Room in her honour, and committee room 1A 002 in the Paul Henri Spaak building of the European Parliament in Brussels was also named the Anna Lindh Room in her memory. The Anna Lindh Professorship of Practice of Global Leadership and Public Policy at the Kennedy School of Government, Harvard University, was established in her honour. Human rights advocate Samantha Power was the inaugural appointee in 2006. 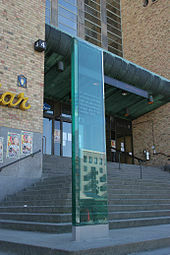 The library at the Swedish National Defence College (Försvarshögskolan) is known as the Anna Lindh Library in her memory. On 11 September 2013, the tenth anniversary of Lindh's death was commemorated in Sweden. Centre for Liberian Assistance (Liberia-2011); Center for Roma Initiatives (Montenegro-2012); Madeleine Albright (2013); Leslee Udwin (2015); Svitlana Zalishchuk (2016) and Mina Dennert (2017). The Lille European School of Political and Social Sciences (ESPOL) named its second year after Anna Lindh. ^ a b c d "Anna Lindh". The Telegraph (obituary). 12 September 2003. ^ Comelli, Michele (July – September 2004). "The Challenges of the European Neighbourhood Policy". The International Spectator. 39 (3): 97–110. ^ Delling, Hannes (10 September 2013). "Fallet Lindh fick Säpo att tänka om" [The Lindh case got the Swedish Security Service to rethink]. Svenska Dagbladet (in Swedish). Retrieved 6 March 2018. ^ "Sverige och världen i chock - reaktioner på Lindhs död" [Sweden and the world in shock - reactions to Lindh's death]. Sydsvenskan (in Swedish). 11 September 2003. Retrieved 6 March 2018. ^ Nylén, Susanne (13 January 2004). "Här möter mördaren Lars Leijonborg" [Here the killer meets Lars Leijonborg]. Aftonbladet (in Swedish). ^ "Anna Lindh killer breaks silence over murder". The Local. Sweden. 28 August 2011. Retrieved 20 June 2016. ^ Gavel, D. (14 September 2006). "Power named first Anna Lindh Professor". Harvard Gazette. ^ Sahlin, Mona (11 September 2013). "Ten years since the death of Anna Lindh" (video). Sveriges Radio. Retrieved 11 September 2013. ^ "About the Memorial Fund". Anna Lindh Memorial Fund. Archived from the original on 7 August 2011. Retrieved 13 May 2011. ^ "Anna Lindh-Prize". Anna Lindh Memorial Fund. Retrieved 8 February 2014. ^ "Burmanet " Deutsche Presse-Agentur: Myanmar activist wins Anna Lindh Prize". BurmaNet News. Deutsche Presse-Agentur. 2 June 2008. Retrieved 8 February 2014. ^ "Pristagare och stipendiater 2010 | Anna Lindhs Minnesfond" (in Swedish). Anna Lindh Memorial Fund. Retrieved 8 February 2014. ^ "FWCC-EMES: Jean Zaru receives the Anna Lindh Memorial Prize in Stockholm". Friends World Committee for Consultation, Europe and Middle East Section. 2010. Retrieved 8 February 2014. ^ Glover Frykman, Sue (22 June 2010). "The Friend - Jean Zaru wins justice award". London: the Friend. Retrieved 8 February 2014. ^ "Pristagare och stipendiater 2011 | Anna Lindhs Minnesfond" (in Swedish). Anna Lindh Memorial Fund. Retrieved 8 February 2014. ^ "Pristagare och stipendiater 2012 | Anna Lindhs Minnesfond" (in Swedish). Anna Lindh Memorial Fund. Retrieved 8 February 2014. ^ "Pristagare och stipendiater 2013 | Anna Lindhs Minnesfond" (in Swedish). Anna Lindh Memorial Fund. Retrieved 8 February 2014. ^ "Anna Lindh Prize 2013 goes to Madeleine Albright - Sveriges Radio". Radio Sweden. 3 September 2013. Retrieved 8 February 2014. ^ "Ministers received filmmaker Leslee Udwin". Government.se. 11 September 2015. Retrieved 10 October 2017. ^ "Photos: Women, development & Security with the Anna Lindh Memorial Fund". British Embassy Stockholm. 2015. Retrieved 10 October 2017 – via Facebook. ^ "2016: Svitlana Zalischuk, parlamentariker från Ukraina" (in Swedish). Anna Lindh Memorial Fund. Retrieved 20 February 2018. ^ "Anna Lindh-Priset 2017: Mina Dennert" (in Swedish). Anna Lindh Memorial Fund. 2017. Retrieved 20 February 2018.